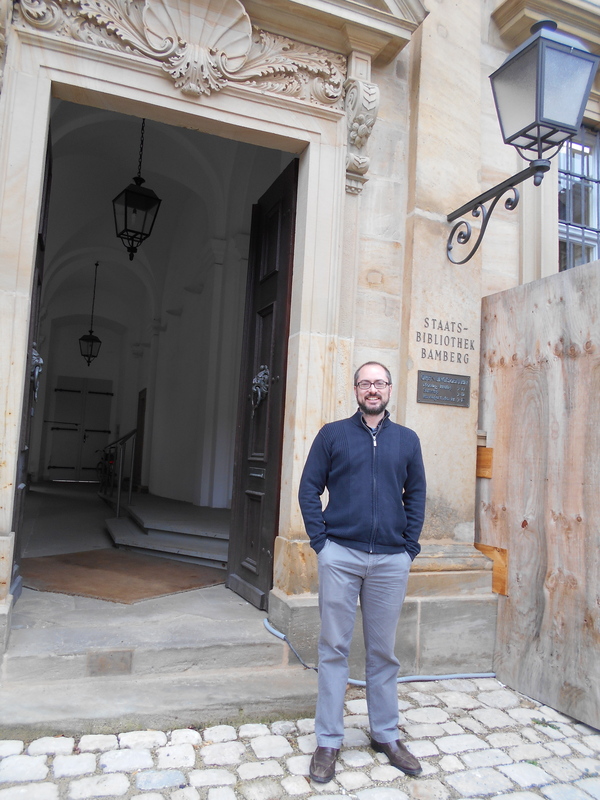 Jeffrey taking a break from measuring rulings outside of the Staatsbibliothek Bamberg. 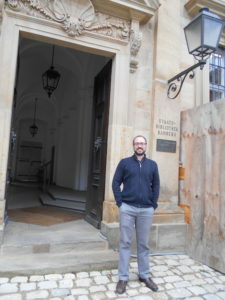 With funding provided by a GSAS Research Fellowship, graduate student Jeffrey Doolittle has been able to spend six and a half weeks this autumn at five research libraries in Europe working with several Beneventan manuscripts that will be integral to his dissertation. Jeffrey’s project explores the medical monastic culture of the early medieval Benedictine abbey of Montecassino through a study of one of its products, Archivio dell’Abbazia, cod. 69, a compendious manuscript produced in the late ninth century. Part of his project entails an extensive codicological and paleographical analysis of Montecassino 69 in comparison with other early medieval manuscripts written in the Beneventan script. 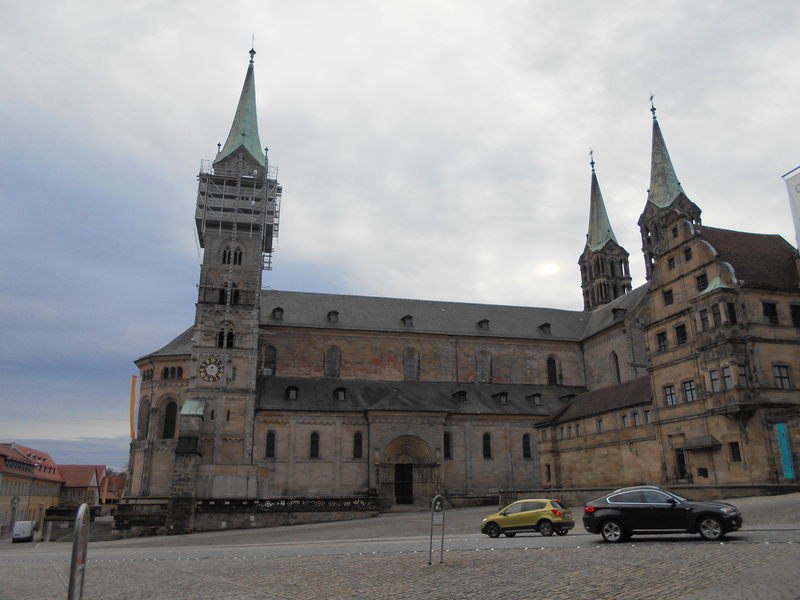 So, in order to collect the data for this portion of his dissertation, Jeffrey has traveled to study manuscripts in the collections of the Universiteitsbibliotheek Leiden (the Netherlands), Det Kongelige Bibliotek (Copenhagen, Denmark), and the Staatsbibliothek Bamberg (Bamberg, Germany). 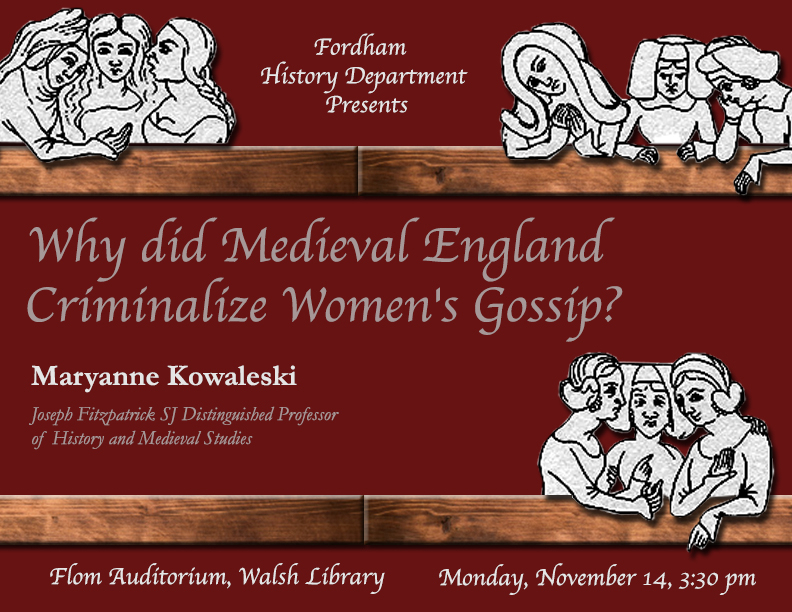 And over the next few weeks, he will make two more stops at the Bayerische Staatsbibliothek in Munich and finally the Österreichische Nationalbibliothek in Vienna, all before the holiday break! Through the course of this journey, he will study a total of eleven manuscripts. So far, the trip has been extraordinarily productive and rewarding, and Jeffrey has enjoyed conversations with the wonderfully friendly librarians and specialists, including Erik Petersen in Copenhagen and Stefan Knoch in Bamberg. Still, he looks forward to returning home to his family for the holidays, and preparing for another research trip to Italy in the spring! The view of the Bamberger Dom from the entrance to the archives where Jeffrey is standing in the picture above. Waiting idly in the Houston International Airport for the evening flight to LaGuardia on Wednesday, I thought back to a lunch I had long ago as a very young person in New Haven. In the summer of 1980, one of my classmates was the daughter of the recently retired Speaker of the House, Carl Albert. He invited me to lunch and the candidacy of Ronal Reagan came up. The famous and crafty Democratic politician looked straight into my eyes and said, with complete conviction, “I can tell you one thing for certain—Ronald Reagan will never be elected president of the United States.” That lunch has haunted me now for a year, and with good reason: despite all the improbabilities, Donald Trump is going to be the President of the United States. Sifting through the evidence about what happened this year and why will take some time, but a few facts about American democracy become clear. Looking around me, I realize the Houston International Airport is named after a President Bush (George Herbert Walker Bush), and we have to acknowledge (reluctantly) a remarkable feat for Donald Trump. In the course of 11 months, he has decisively dismantled both political dynasties that have dominated American politics for some thirty years. To win the Republican nomination, he bested Jeb Bush (or Jeb! as he sought to play down the family name) and left one dynasty in tatters. Now he has done the same to the Clintons, and there is nothing left. These two families have held the presidency for twenty of the last twenty eight years (71%) and were hoping for twenty eight out of thirty six (78%). Whatever we might think about Trump, to have the American presidency tossed back and forth between elite families is not how we envision democracy. I wonder how much of the same fatigue and resentment that undid Jeb also played against Hillary Clinton. Also, until 2000 (Bush vs. Gore), in only three instances in all of American history had a candidate won the presidency without winning the popular vote—the last time in 1888. Now it has happened twice in four elections, and both times the winner was the Republican candidate. Digging still deeper uncovers another surprising (and disturbing) fact: Since 1988 (Bush vs. Dukakis), a Republican presidential candidate has only won the popular vote once (Bush vs. Kerry, 2004). That is one out of seven election cycles. 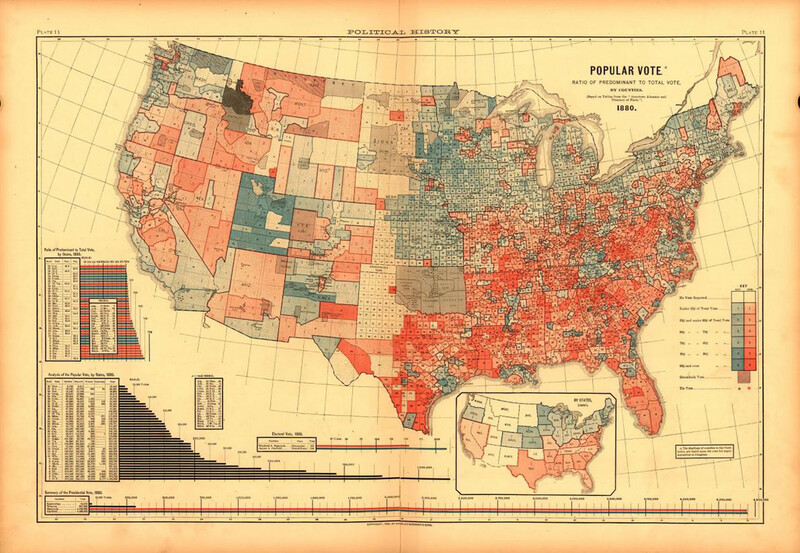 How different would the country look today if the popular vote actually determined the outcome? Finally, going back to fateful 1980, one of the themes that year was the contrast between Reagan’s sunny optimism and Jimmy Carter’s pessimism (born of Reinhold Niebuhr’s sense of the “politician’s sad duty to establish justice in a sinful world”). In 1992, Bill Clinton believed “in a place called Hope” (Arkansas, which I actually visited). In 2008, Barack Obama won because of the “audacity of hope” in a year of despair (“Yes, we CAN!). We can use many words to describe the appeal of Donald Trump to 59,000,000 voters, but one thing is sure: “hope” isn’t one of them.